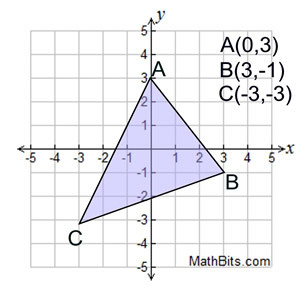 Which of the following choices describes the transformation of ΔABC shown in the graph at the right? 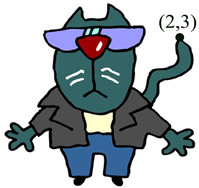 Triangle CAT has vertices C (2,3), A(-2,6) and T(-1,-4). A translation maps the point A to A' (-1,4). What are the coordinates of C' under this translation? Which of the following choices describes the transformation of TRAP, as shown in the graph at the right? The shape shown in the diagram at the right is reflected over the x-axis and then reflected over the y-axis. 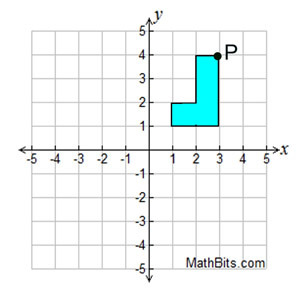 a) What are the coordinates of the image of point P after these two transformations? 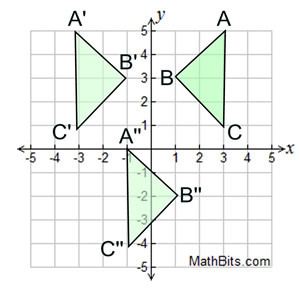 b) Which choice represents the orientation of the shape after the two transformations? 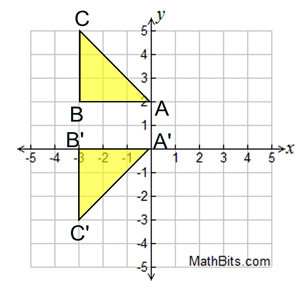 ΔABC, with A(4,5), B(-2,0), and C(0,-4), is to be reflected over the x-axis. 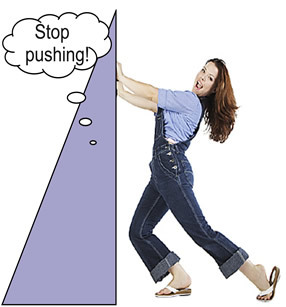 Which of the vertices, if any, will remain static (will not change its position) during the transformation? All of the vertices will change. ΔABC and its reflection can be seen in the graph at the right. What is the equation of the line of reflection? (x, y) → (x - 3, y - 1)? 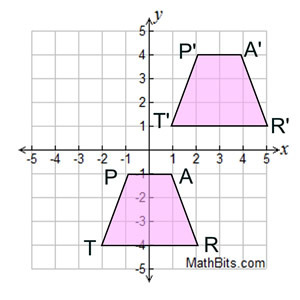 Triangle ABC is to be transformed under a dilation in the origin with a scale factor or 1/3. 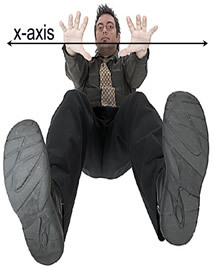 What are the coordinates of the image of vertex C under this dilation? 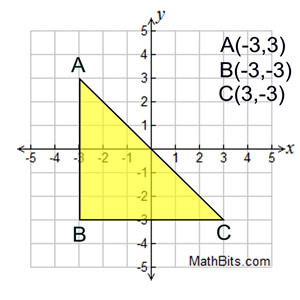 A dilation in the origin with a scale factor of 2 is applied to ΔABC. What is the length of A'B' ? Which of the following descriptions (pertaining to the graph at the right) is true? ΔA"B"C" is a translation of ΔABC. ΔA"B"C" is a translation of ΔA'B'C'. 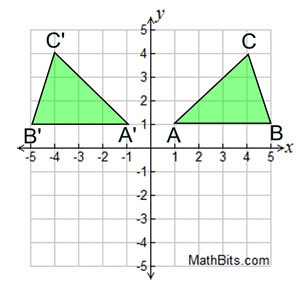 ΔA"B"C" is a dilation in the origin of scale factor 2 of ΔABC. ΔA'B'C' is a translation of ΔABC.